I'm so grateful for reader friends you know and trust. Mine always bring me the best finds, ones I would likely completely miss otherwise. 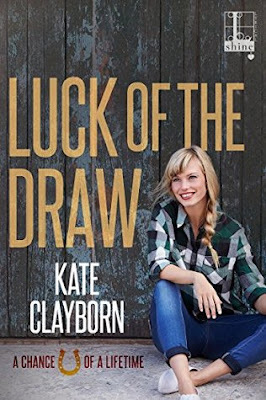 Such was the case with Kate Clayborn's Luck of the Draw. I'd seen it floating about the 'verse for a little while now. But something about the cover inexplicably gave me country music vibes. And I just was not in the mood for that story right now, you know? But then the excellent Brie took to talking it up on Twitter, and thank heavens for that. Because I bought it on her word alone and am so very glad I did. Nothing about it has anything to do with country music. In fact, it is quite a serious tale about two wounded people who have no reason whatsoever to like the other person, but who are trying hard to improve themselves and the lives of those around them. If that sounds like something you're in the mood for, then by all means, read on. Zoe Ferris and her two best friends won the jackpot. Literally. Jointly, they bought a lottery ticket and won. And nothing has been the same since. But while Kit and Greer are learning to navigate the ropes of their new lives, Zoe is floundering. A successful lawyer, she finds herself in deep waters as she tries to make amends to a family involved in a settlement she worked on. Which is how she finds herself of Aiden O'Leary's doorstep, hat in hand. For his part, Aiden would like to see Zoe suffer for every dollar of the settlement money Zoe brought his parents' way. In the wake of his twin brother's death, Aiden is alone and desperately trying to make something out of his suffering. If using Zoe is what it takes to do so, then so be it. And so Aiden convinces Zoe to pose as his fiance as part of his proposal to buy a wildness camp and turn it into a center for those struggling with addictions similar to the way his brother did. Zoe sees it as the least she can do, though pretending to love the wildly closed off Aiden stretches even her ability to sell something. I expected something . . . lighter, perhaps? I'm not sure what I thought this might be. But I can tell you, I was in no way dissatisfied with what I got. Zoe and Aiden are rather magnetic. We enter the story at their collective and individual low points. Aiden is an EMT who isolates himself from his fellow colleagues and sees his dead brother's face in every body on the gurney. Zoe used to have everything effortlessly together, but one family's loss and a seemingly incongruent windfall of her own have thrown everything off kilter, and she can't find her way back. The two of them are in a bad way. And it's truly painful watching them try to put on a show for the owners of Aiden's precious campground. The contempt he holds for everything she represents, and the awkward way she forces herself to inhabit whatever role she thinks he wants her to is positively wretched. Meanwhile, Zoe's friends are increasingly concerned about her, Aiden's co-workers can see how tattered he's becoming, and the whole thing seems bent on breaking. But then. Then Zoe's innate verve dislodges something inside Aiden, and he is able to see clearly just long enough to lose grip on his frozen demeanor and realize Zoe may not be something he wants (or can afford) to let go. And that is when the humor and infectious happiness kick in. That is when things get real, in the best sense. And the whole thing leads up to one of the loveliest declarations I have had the pleasure of reading. I just . . . well done, Aiden. Truly. I had such a good time with this cast of characters, I immediately went and read the first book in the series after finishing this one. It, too, was a pleasure, and I am avidly looking forward to Greer's story in the third book, which is due out in November. Kate Clayborn writes stories full of emotional intensity and vulnerability that manage to keep both her characters and her readers afloat. I recommend them.